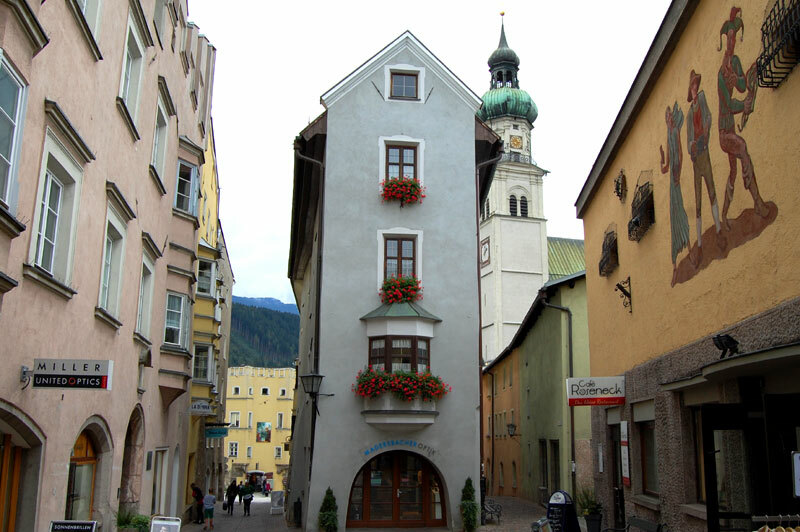 Hall in Tirol is one of Austria’s best preserved and finest historical cities. Surrounded by the alps, with hiking and skiing areas just around the corner, Hall is worth a visit, summer and winter. A little in the shadow of Innsbruck, which is only 10 kilometres further west, Hall does not receive visits to countless busloads with tourists. Something that we appreciated when we strolled around in picturesque Hall. 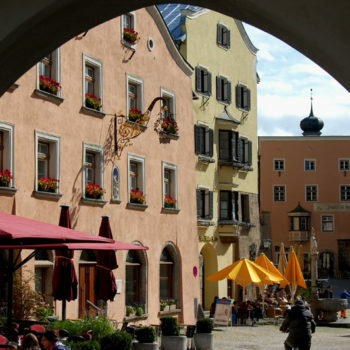 We just love these small historic cities in Austria. The hustle and bustle of daily life, makes Hall much more than an “open air” museum, and creates a nice atmosphere. People shop, sip cappuccinos at outdoor cafes, while tourists stroll around photographing the lovely buildings. 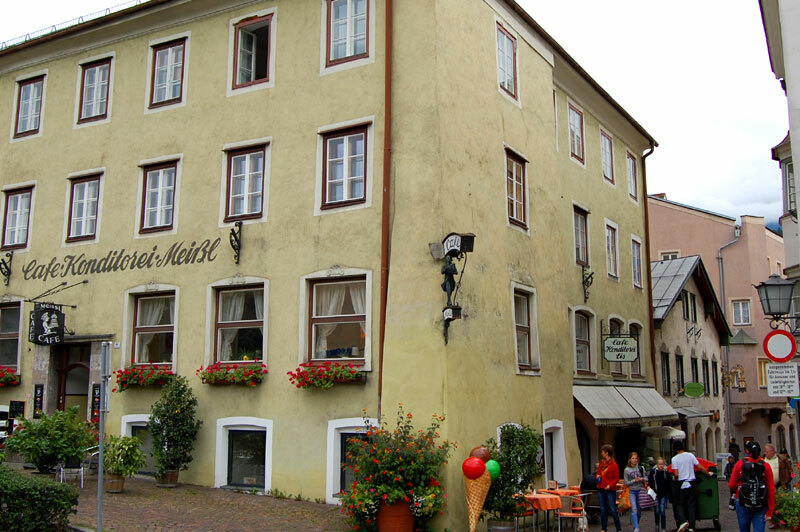 We went to Hall because it’s supposedly one of the finest small towns in Austria. It took a few hundred years to get there. 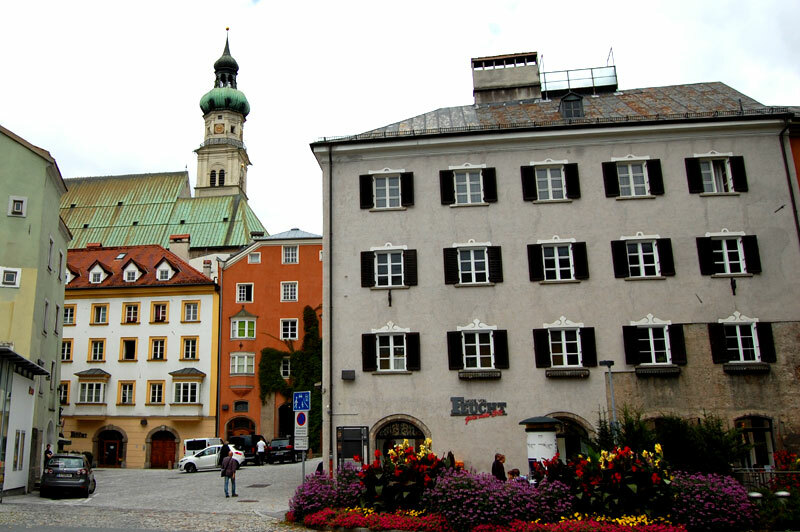 Hall received city status already in 1303, but first when the Habsburg Empire’s coin stamping was moved here from Meran (today in South Tyrol) in 1477, the city reached its peak. In the 15th and 16th century Hall was one of the most significant cities in the vast Habsburg Empire. It is said that only the capital Vienna was more important in the Empire than Hall. It may seem a bit like bargaining for tourists today, but it’s actually true. 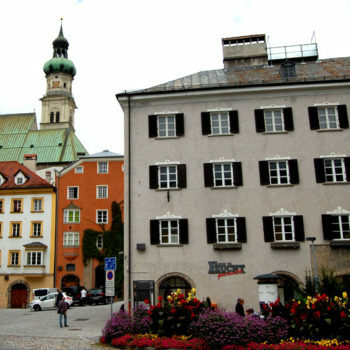 The well-preserved old town in Hall is a testimony of the former splendour and influence. For visitors it means a lovely old town which you can ramble around and enjoy, within a couple of hours. 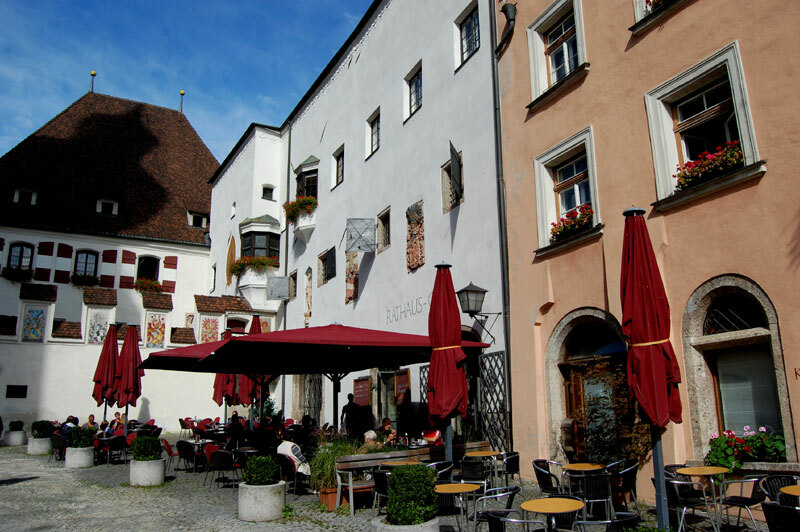 After picking up a city map and receiving some info at the local tourist office at Burg Hasegg, we suggest that you take a coffee at one of the cafés at Oberer Stadtplatz, which is the centrepiece of the historic city center. As most of the small streets also run out from this square, it is a good place to start the city walk. The old town is only around 400 x 300 meters, so there is no danger of getting lost. Take your time and do not forget to look up, as the beautiful houses often have nicer facades at upper levels, than down the street level. 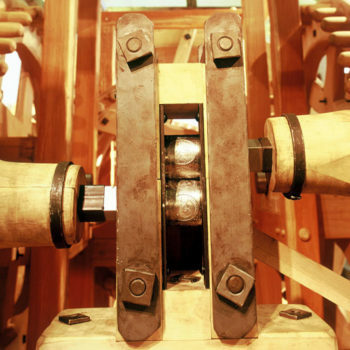 The town has a long and important history which you can see in Hall’s museums. We visited a couple of them and did not regret it. But first, a few words about salt and how Hall got its name. 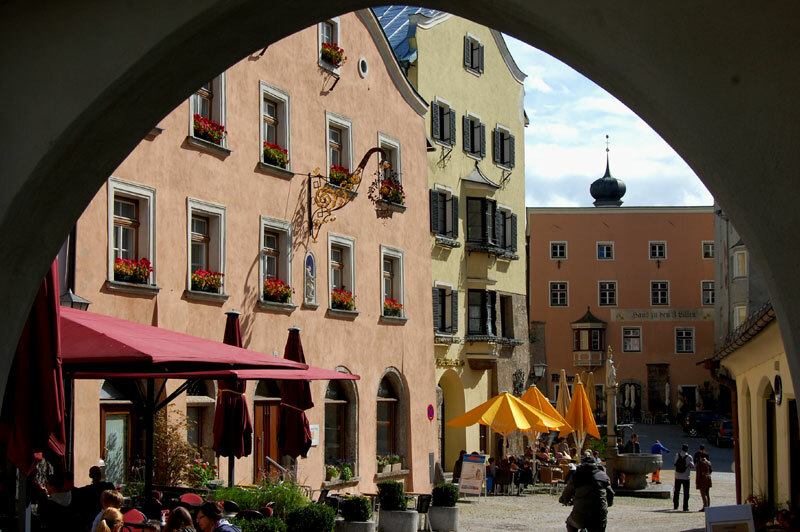 You may be familiar with the word “Hall”, which occurs in several place names in Austria. 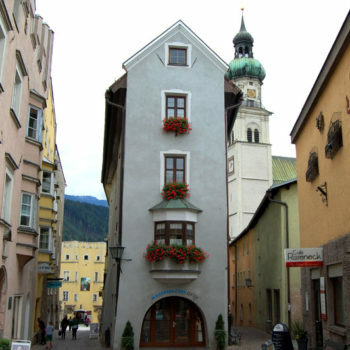 The most famous of the “Hall towns” is Hallstatt. 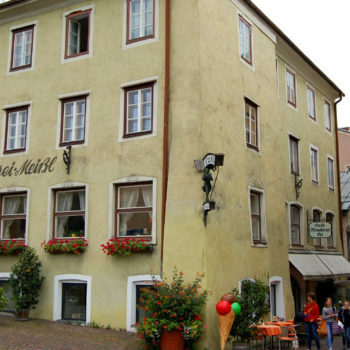 In addition, there is Hallein. 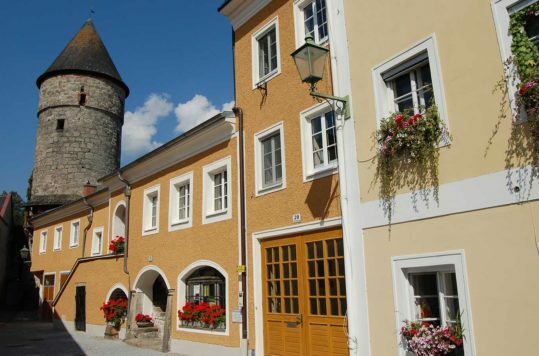 Moreover, the Tyrolean small town Hall, also obtained its name from the salt (hall) extraction in the vicinity. From around the 1300s until the last salt mines closed in 1967, large scale salt mining that took place on in the surrounding mountains. 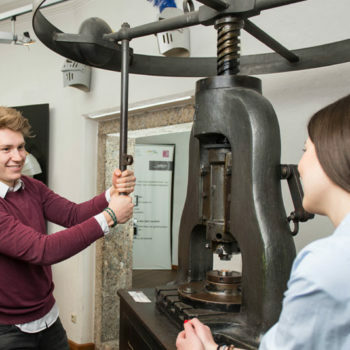 If you are interested in knowing a little more and get a feel of the hard life in the salt mines during the Middle Ages, visit the Bergbaumuseum (mining museum). 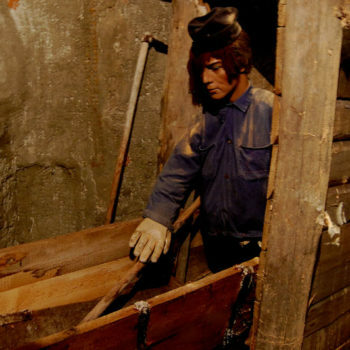 In the narrow basements of a so-called Bürgerhaus, where wealthy citizens lived in the Middle Ages, you find a mock salt mine. 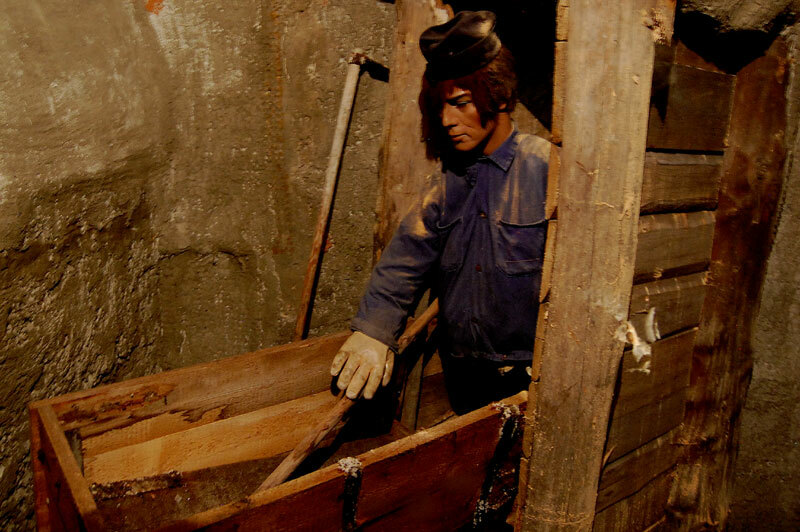 Sure, it neither has the noise, the smell nor the moldy air of a real mine, but the equipment and the replica of the narrow shafts gives you a little insight into the terrible working conditions. The one-hour guided tour costs € 5. 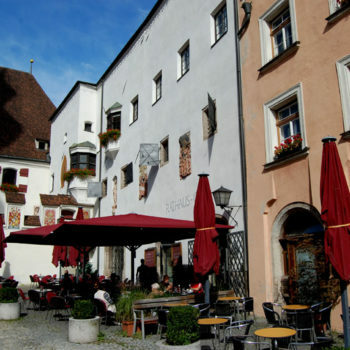 Another highlight and mandatory attraction in Hall is the medieval castle Hasegg and the Mint Museum. The castle itself is perhaps not the most spectacular in Austria, but in combination with the Mint museum you get a small introduction to medieval history from Austria. 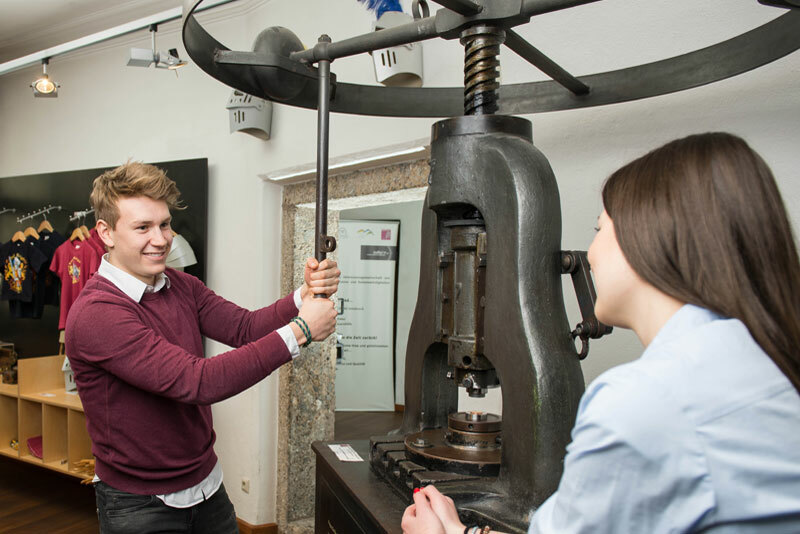 We are not going to get into the monetary system and its creation, but the replica of the world’s first mechanical coin press, which you see in the museum, was of great importance for the use of coins. 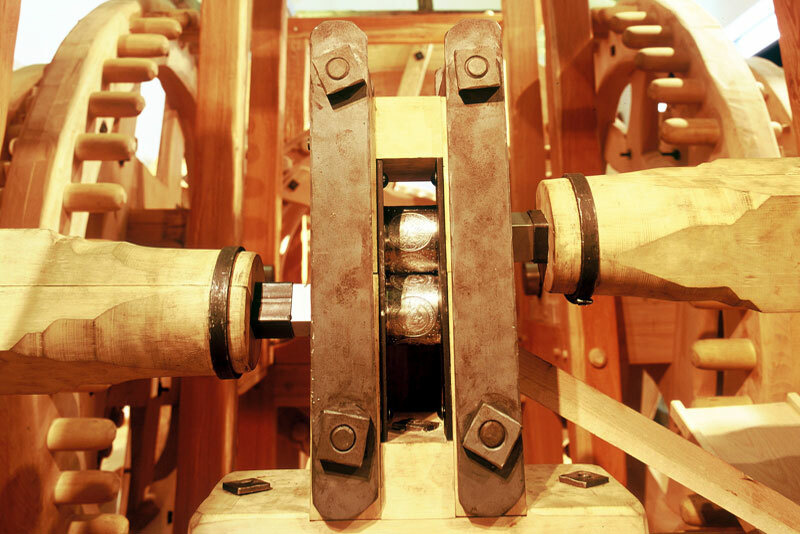 The massive wood machine, which produced up to 4000 silver coins per day, is impressive. Hall likes to be called the cradle of the modern day “Dollar”. Before leaving the museum, you can stamp your own little coin as a souvenir. After an introduction to the history of the coin, you definitely should climb the Mint Tower. The around 200 steps will be forgotten you as soon as you see the view from the top. We opted to stay in idyllic Tulfes (10 min / 7 km from the Hall by car), which is almost 400 meters higher up in the Alps. Hall and surrounding area of many beautiful nature experiences of course, with its location in the middle of the Alps. Although there was no time during this visit, we were inquiring about possible activities. Not surprisingly, we are after all in Austria, the hiking possibilities are ranging from simple walking routes that lead you through idyllic alpine villages, to advanced hiking trips deep into the mountains. Thus, you can easily combine nature and history within 2-3 days in Hall. We parked at Salinenparkplatz by the Tourist Office, which is just after the bridge over the river Inn, as you arrive from the A12 motorway. It costs just a few Euros and you can park up to 3 hours.